It was the house that did for him. Former Defense Minister Akis Tsochatzopoulos succumbed to the base desire of enshrining his wealth and potency in real estate. Hubris, however, blinded him to the dangers of choosing a property within a marble fragment’s throw of the Parthenon. 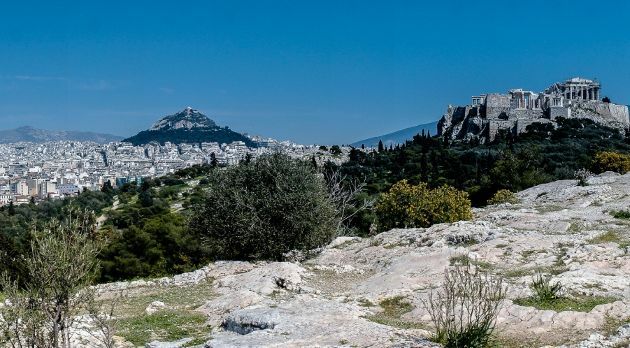 On some days, the Acropolis’s shadow virtually touched the luxury apartment the PASOK veteran purchased on Athens’ most exclusive road. But a symbol of ancient democracy and a product of modern political corruption could not co-exist in such proximity for long. After years of living as an untouchable, Tsochatzopoulos discovered he was not as immune as he thought. Despite squirreling away millions from his time in government, his desperation to amass property, proved to be his downfall. If scientists could find a way to measure people’s units of thought, they would discover that the British think in pints, the French in grams, the Germans in euros, the Italians in kilometers per hour and the Greeks in square meters. This is the yardstick that many Greeks use to measure their social status, their wealth and their happiness. If you have plenty of square meters in your name, the thinking goes, you and your children are set for life. It’s like real estate kryptonite to ward off any unwelcome financial surprises life may throw at you. The apartment on Dionysiou Areopagitou Street was just one of many properties Tsochatzopoulos bought with the money he earned soliciting bribes from suppliers to agree arms contracts. It was a jewel in the crown that toppled from the 74-year-old’s head last week when an Athens court sentenced him to 20 years in jail for money laundering along with 16 others, including his wife, ex-wife, daughter and cousin. The only square meters Tsochatzopoulos can measure now are those in his Korydallos Prison jail cell. His kryptonite proved to be pyrite. The former minister is only likely to spend a fraction of his term in jail but that does not take away from the significance of the ruling. Apart from the fact that the Greek state has got a chance of winning back some of the 55 million euros in kickbacks that Tsochatzopoulos accepted, his jailing also carried great symbolism. It is the first conviction of a former cabinet member since the early 1990s and comes a few months after ex-Thessaloniki Mayor Vassilis Papageorgopoulos was imprisoned for embezzlement. There was a time not too long ago in Greece that these men would have slept easily at night, knowing that they would never face the consequences of their actions. The combination of absent political will, entangled interests, weak institutions and a malleable media would have guaranteed them freedom. There is little doubt that along with so much that is negative, the crisis has also brought with it a positive: Greeks are angry that such crimes are rarely punished, and this deep and pervading sense of injustice has forced the government and the judiciary to act, at last. The system cannot just live off small fry. Tsochatzopoulos is a big fish, there should be no doubt about that. For years, there was intense speculation about how “Akis,” as he was known to most Greeks – the civil engineer who had met future Prime Minister Andreas Papandreou in 1968 as an exiled student in Germany – had managed to acquire such wealth to purchase this property. In February 2011, more than 1,000 protesters had gathered in the rain outside the luxury apartment. “Bring back our money,” they chanted. Since Tsochatzopoulos left active politics and married his second wife, Viki Stamati, in a lavish ceremony in Paris in 2004, rumours and reports about his exploits have abounded. It was alleged that he used his various ministerial posts – interior, defence, transport, public order, development, labour and public works – to make himself into a multi-millionaire. But as time passed and his exploits became folklore, voters resigned themselves into believe the he was one the untouchables that would get away with abusing their power for personal profit. His luxury apartment in the shadow of Golden-Age ancient Greece became an unintended monument to the modern era of post-dictatorship Greek politics when theft, be it by taxpayers or politicians, became an acceptable by-product of social peace and prosperity. This disease reached the very top echelons of Greek politics. It is worth remembering that Tsochatzopoulos served as caretaker prime minister in 1995 when Andreas Papandreou fell ill. He agreed on Greece’s behalf at the Madrid European Council that year to the decisions to include Eastern and Central European countries in the EU and to name the single currency the euro. A year later, he came within six votes of becoming the new Greek prime minister instead of Costas Simitis. Nevertheless, the 74-year-old’s conviction is not a panacea. The sense of injustice that helped bring it about has not been sated. In fact, “Akis” being behind bars only makes the failure to convict others more pronounced. As long as the Siemens scandal and the Lagarde list, for instance, fail to result in arrests, confiscations and jail sentences, the more Tsochatzopoulos will seem like a scapegoat, a patsy tossed out to keep the baying crowd occupied. It is now, in the wake of the ex-minister being locked up, that the political system, the judiciary and the media must prove how serious they are about helping Greece jettison the baggage of the past. This is a more serious test of how far and fast the country is willing to change than anything the troika and its technical teams can conjure up. Facts have to replace rumours, names must substitute innuendo and justice must shine through the cloak of impunity. Tsochatzopoulos lost his apartment but it is the house of cards that must be brought down. In your former blog you carefully avoided investigative journalism telling names, and so does ekaterimini. What are the roots and causes of this difference to habits in other western countries? Is there any investigative journalism in Greek language? That's what is missing in most of the articles. Investigative journalism that names the responsible persons _in advance_!